Bradley Cooper Leather Jacket ..
Arrow Season 3 Leather Jacket ..
Fast and Furious 6 Vin Diesel Leather Jacket ..
Fast And Furious 7 Jason Statham Black Leather Jacket ..
Fast and Furious 7 Movie Jason Statham Leather Jacket ..
Fast And Furious 7 Vin Diesel Leather Jacket .. Faster The Rock Dwayne Johnson Black Leather Jacket ..
Father Jack Landry V Series Joel Gretsch Leather Jacket ..
Field Of Lost Shoes Courtney Gains Leather Jacket .. Flash Point Donnie Yen Leather Jacket .. 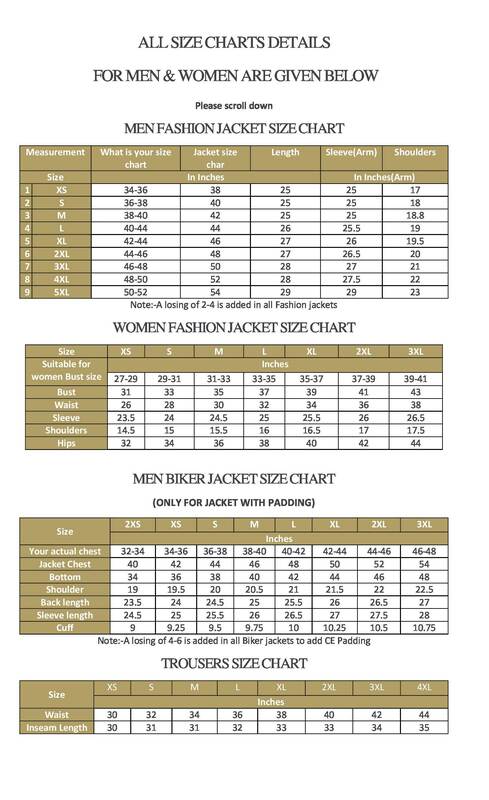 There is no shortage of choices in Leather Fashion Valley and buyers can simply find a jacket of their choice but choosing the exact size over the Internet has never been an simple task. We at Leather Fashion Valley offer best solution to this.